Thomas John Watson Sr. (1874 - 1956) became a sales apprentice with the National Cash Register Company (NCR) in 1896. There he worked his way up to General Sales Manager in 1903. In 1911 Watson introduced the slogan "THINK" by which he meant "to take everything into consideration .. and then act". In 1914 Watson joins the Computing-Tabulating-Recording Company (CTR, later IBM) as General Manager to become its President in 1915. Watson brought the slogan "THINK" with him. THINK signs were hung on the wall of every room in every building. Employees carried a THINK notebook in which to record ideas. IBM's monthly magazine Time was renamed 'Think'. The word was a part of IBM's corporate culture. Decades later IBM products like the ThinkPad laptop computers still honor the idea behind the slogan. 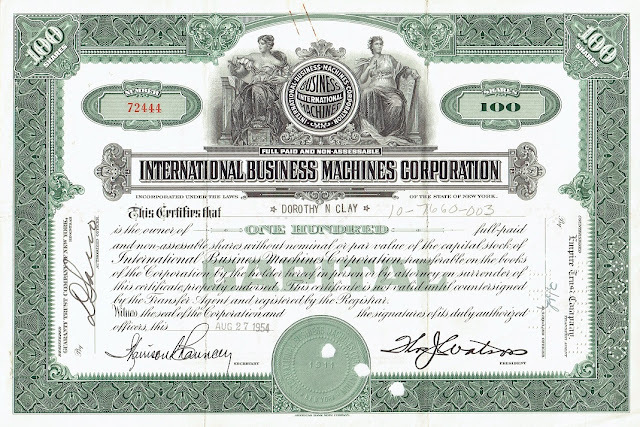 When Watson Sr. became CEO in 1924 he changed the company's name into International Business Machines (IBM). In 1928 he ordered the development of a standardized punched card for data processing machinery. Watson let two research teams work on it independently of one another. A card type with rectangular holes and 80 columns was chosen. It required new machinery that could work with the rectangular holes. The "IBM Computer Card" became the major medium for information storage and reporting for many decades. Punched cards were even used for U.S. Government savings bonds. and struck by the Medallic Art Company of New York. Carl Paul Jennewein (1890–1978) was a German-born American muralist, sculptor and medal artist. In 1916 he received the Rome Prize by the American Academy in Rome, Italy. the bronze doors at the Rockefeller Center in New York. In 1937, Watson was elected president of the International Chamber of Commerce. The ICC is a business organization with member companies worldwide from every sector. It promotes international trade and responsible business conduct. At the 1937 ICC congress in Berlin Watson stated the conference keynote to be "World Peace Through World Trade". During the congress, he was honored with the Order of the German Eagle medal. The award was given to leading foreigners who were considered sympathetic to Nazi Germany. Watson received it for the help that IBM's German subsidiary DEHOMAG provided to the Nazi regime with the tabulation of census data (such as the location of Jews). Allegedly he believed that the medal was in recognition of his efforts in promoting global commerce and peace. President Franklin D. Roosevelt appointed Watson Sr. to United States Commissioner General to the 1937 International Exposition in Paris. At the end of 1937 Howard Aiken, a doctoral student at Harvard, presented to IBM the concept of a programmable, automatic computing device. In 1939, Watson agreed to finance the building of Aiken’s Automatic Sequence Controlled Calculator. This electromechanical computer became known as the Harvard Mark I. When World War II broke out and DEHOMAG came under full control of the Nazi government, Thomas Watson Sr. returned his medal. He also introduced the "1% doctrine" for war profits : IBM would not receive more than 1% profit from the sales of equipment to the US Government. IBM calculation machines played an important role in data processing tasks for the Allies. John von Neumann used the Harvard Mark I computer for atomic bomb calculations in the Manhattan project. In 1944 Watson orders the design for a bigger computer, the IBM Selective Sequence Electronic Calculator (SSEC). This IBM stock certificate for 100 shares is printed by the American Bank Note Company. The printed signature of Thomas Watson Sr. is located in the lower right corner. considered as the first supercomputer, to the U.S. Navy.